Planetary science is the science of planets or planetary systems, including the Earth and our solar system. Planets and planetary systems, including the central stars, are the most important foundation for life to be generated and sustained. Any search for extraterrestrial life forms would focus on finding a planet bearing air and water and orbiting around a star. Whether the Earth is a special planet formed almost miraculously fit for life or there are many Earth-like planets around other stars has been a long-pursued question. Planetary science may eventually be able to give an answer to this question. Research tends to be done by a combination of astronomical observations, space exploration (particularly unmanned space missions), examinations of meteorites and interplanetary dust particles, experiments using those planetary materials or stimulants, theory and modeling, and considerable use of computer simulation. Planetary science studies objects ranging in size from nanometer-size crystals to gas giants, observing their composition, dynamics, and history. 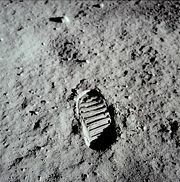 Apollo 11 crew Buzz Aldrin's bootprint. It was part of an experiment to test the properties of the lunar regolith. Planetary science mainly originated from a subfield of astronomy, which deals with celestial bodies inside our solar system. Unlike the mainstream astronomy that mainly deals with gas and plasma, planetary science deals with solid materials, and thus expanded its field by incorporating an interdisciplinary approach. 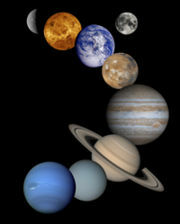 Planetary science draws from diverse sciences and may be considered a part of the Earth sciences, or more logically, as its parent field because the Earth is also a planet. Modern planetary science developed as a boundary area of astronomy and Earth science when extraterrestrial samples such as meteorites became recognized or available in large quantities. The most significant year in that respect is 1969, when three significant events occurred that shaped the formation of today’s planetary science. A Japanese expedition found a concentration of meteorites at the foot of the Yamato Mountain Range in Antarctica in 1969. Since then, expeditions by Japan, the U.S., and other countries found many such sites, collecting tens of thousands of meteorites. In the same year, two large meteorites fell. They are called Allende and Murchison meteorites, which belong to a rare group of meteorites called carbonaceous chondrites. Also in 1969, Apollo 11 landed on the Moon and recovered samples of lunar rocks and soils. The Lunar Science Conference was held in Houston in 1970 to gather research results on the lunar samples. Since then, it has been held every year and was later renamed as the Lunar and Planetary Science Conference (LPSC). The LPSC has greatly helped the formation and development of planetary science. A solar system family portrait assembled from NASA spacecraft images. Not pictured: Pluto. This page was last modified on 4 April 2008, at 00:08.